For NWC magazine contents and PDF files, see the magazine back issues page. December magazine! 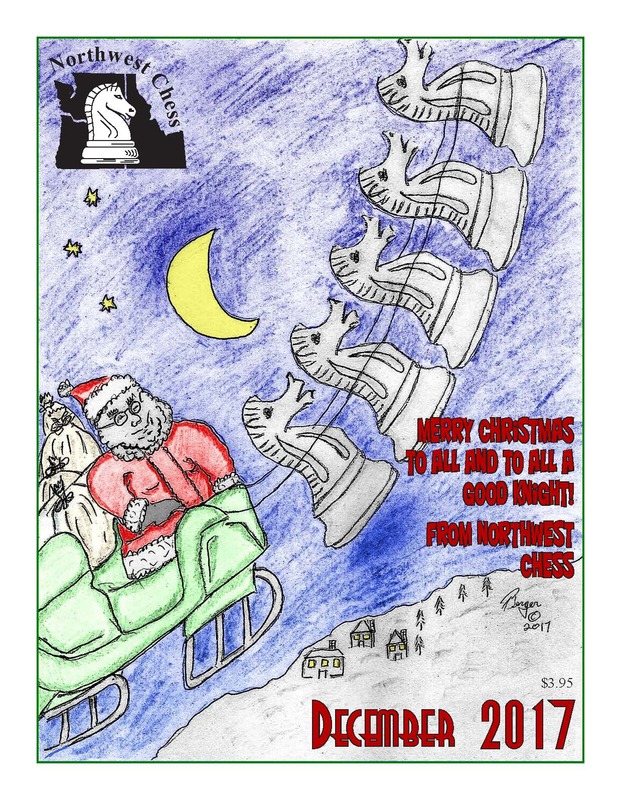 The December issue of Northwest Chess was mailed on 11/30. It's a 32-page issue with 8 color pages! Includes "From The Publisher’s Desk" by Duane Polich, "2017 BCC #15" (and also #16) by Jeffrey Roland, "2017 Eastern Washington Open" by Kevin Korsmo, "Microsoft vs. Amazon 2017 Rivalry Match" by Josh Sinanan, artistic color photos by Philip Peterson, "2017 Portland Fall Open" by Brian Berger, "My Dallas Trip" by Abbie Wu, "2017 Washington Women’s Championship" and "September 2017 Seattle Masters" by Josh Sinanan, "2017 PCC Club Championship" and "PCC October 2017 Game 60" by Brian Berger, "Hayhurst Halloween K-12 Scholastic Chess Tournament" by Chad Lykins, "October 2017 Seattle Masters" and "2017 WA G/60 + Blitz Championship" by Josh Sinanan, and a back-cover photo of Eli Sanders by Adam Porth. Cover: Merry Christmas cartoon from Northwest Chess by Brian Berger. In Memoriam - GM William Lombardy, 1937-2017, who although best known as Bobby Fischer's second during the 1972 world championship match against Spassky, had the talent to become one of the world’s top players, had he not decided to become a priest instead. See article #1 and article #2 on John Henderson's blog. November magazine! 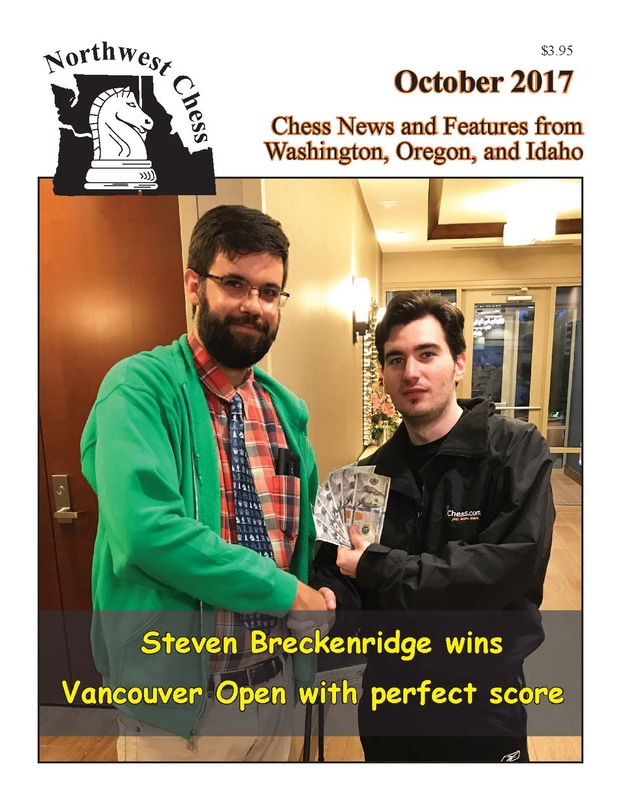 The November issue of Northwest Chess was mailed early on 10/19! It's a 32-page issue with "Feldman’s Folly" by Ralph Dubisch, "Oregon Open" by Brian Berger, "More Jim Tarjan" by Jim Tarjan, "PCC September 2017 Game 60" by Brian Berger, "Inaugural Seattle Chess Classic" by Josh Sinanan, "Game From Recent Event" by Brian Lange, and a back-cover photo entitled “I’ve Just Seen A Face” by JR & AM. 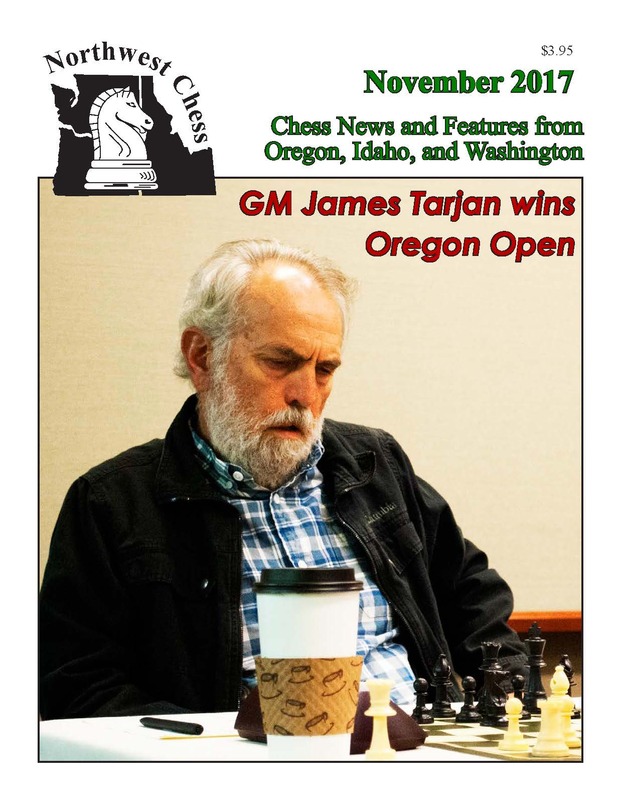 Cover: GM Jim Tarjan at the 2017 Oregon Open by Jeffrey Roland. Note: Grand Prix report updated as of the evening of Nov. 8. In Memoriam - 35 year old Staff Sgt. Bryan Black of Puyallup was one of four Green Berets killed when they came under fire in Niger on Oct. 4. He served as a Special Forces Medical Sergeant. Bryan was an active chess player in Washington State in the 1990s and 2000s. His last US Chess rating was 1975. He was Tacoma Chess Club champion in 1999 and graduated from Puyallup High School in 2000. Our thoughts are with his family. The City of Puyallup held a memorial service on Sunday Nov. 19 at Pioneer Park Pavilion. See story on The News Tribune website. | See the Tacoma Chess Club history page for club champions. October magazine! The October issue of Northwest Chess was mailed on 9/27. It's a 32-page issue with "Vancouver Open" by Sarah McCoy, "July 2017 PCC Game 60," "2017 Oregon Senior Open" and "August 2017 PCC Game 60" by Brian Berger, "East Idaho Senior Games" by Jay Simonson, "Portland Rapid and Blitz Championships" by Micah Smith, "Spotlight On Roshen Nair" by Brian Berger, "BCC #14" by Jeffrey Roland, "2017 Inaugural Hall of Fame" by Adam Porth, and a back-cover photo of "Roshen Nair holding U.S. Junior Open trophy" by Sanjay Nair. Cover: WCF President Josh Sinanan (L) and FM Steven Breckenridge, winner of the 2017 Vancouver Open. Photo Credit: Jacob Mayer. September magazine! The September issue of Northwest Chess was mailed on 8/24. 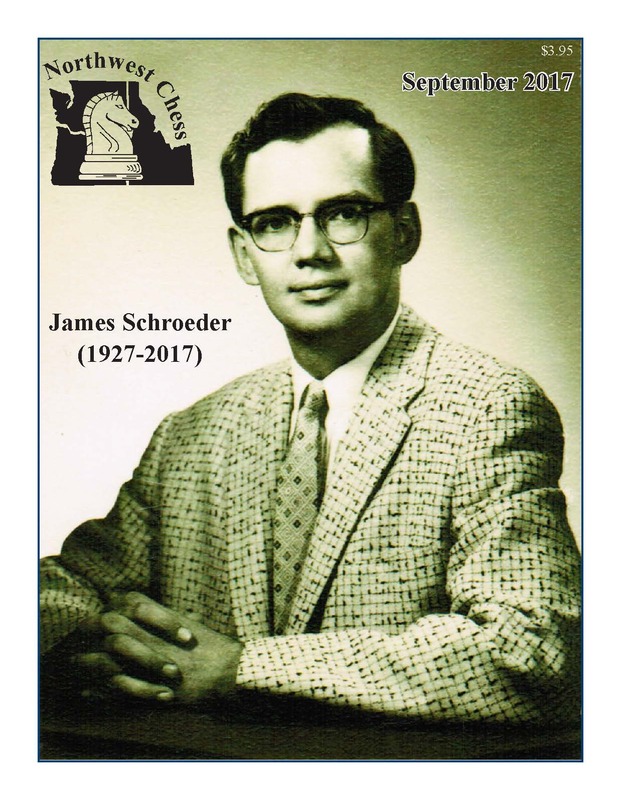 It's a 32-page issue with "Remembering James Shroeder (1927-2017)" by John Donaldson, "2017 ICA Summer Classic" by Jeffrey Roland, "Rose City Sectionals" by Brian Berger, "N.W. Represented Well at National Scholastic" by Owen McCoy, "July 2017 PCC Quad 45" by Brian Berger, "CJA Award for 2017 Best State Magazine," "A Little Chess Nostalgia from 1979" by Philip Peterson, "2017 Washington State Championship Brilliancy Prizes (Part 2 of 2)" by Michael Hosford and Eric Tohni, and a back-cover photo of James Schroeder at 2012 US Open in Vancouver by Jeffrey Roland. Cover: James Schroeder circa late 1950s/early 1960s, by James Schroeder. Advertising Omission! Northwest Chess regrets that the business card for Master's Academy in Boise, Idaho, was omitted from the September issue of NWC by mistake. Please see the calendar page for the Academy's business card and list of upcoming scholastic tournaments. NWC Wins CJA Award! 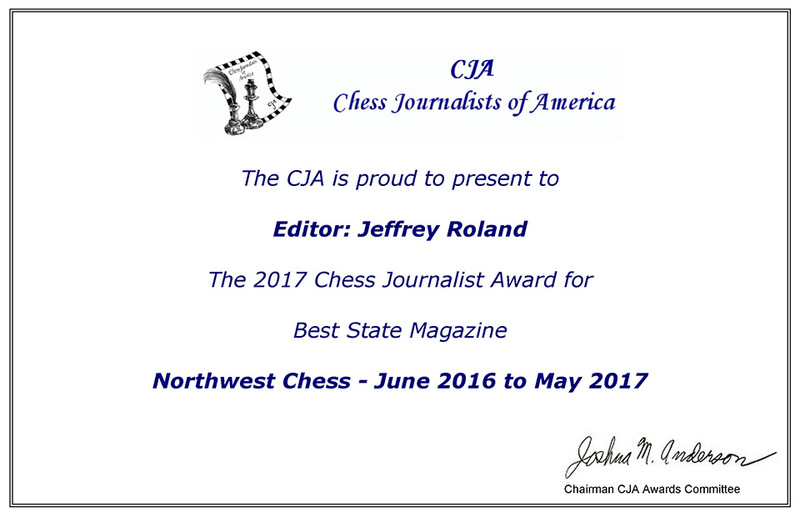 Northwest Chess is pleased to once again be the recipient of the chess journalist award for Best State Magazine, awarded by the Chess Journalists of America (CJA). The 2017 award certificate, shown here, names Editor Jeffrey Roland. Congratulations to Jeff and all of our NWC magazine contributors. US Chess names new Executive Director (Aug. 29) - The United States Chess Federation (US Chess) is pleased to announce the selection of Carol Meyer as its new Executive Director. The selection of Ms. Meyer was made after a nationwide search that attracted more than 100 applicants. "US Chess is very pleased to announce Ms. Meyer's appointment," says Mike Hoffpauir, President of the US Chess Board of Directors. Mike notes, "Carol's deep expertise and years of leadership experience of 501(c)(3) organizations will greatly aid our efforts to fund an array of educational and social chess initiatives in keeping with our recent conversion to a 501(c)(3) educational organization." See uschess.org for more information. Chess companion wanted - Mr. John Epley (photo at left), age 87, is no longer able to travel to his chess club in Vancouver, Wash. due to a disability, and would like someone to visit and play chess. According to daughter Cathy, "He is still cognitively sharp and a delightful man but plays slowly because of his stroke and age. I would be willing to pay someone to spend time with my father playing chess a couple times a week. It would mean a lot to me to find someone to play with him. I guarantee you that they would have a good time with my dad as he is a very interesting man." Contact: Cathy Epley, 503-516-7173, email cepley@mac.com. August magazine! The August issue of Northwest Chess was mailed on 7/26. It's a 32-page issue with "Letter to Editor" by David Lucky, "GM Timur Gareyev Comes to Iowa...I Mean Idaho!" by Adam Porth, "2017 PCC Summer Open," "June 2017 PCC Quad 45" and "June 2017 PCC Game 60" by Brian Berger, "Helping Chess in Equatorial Guinea" by Avi Gupta and Seth Talyansky, "The Xu Open" by Jeffrey Roland, "Northwest Players at the 2017 Women’s Open" by Mary Kuhner, "2017 Washington State Championship Brilliancy Prizes (Part 1 of 2)" by Michael Lee and Curt Collyer, and a back-cover photo of Fred Kleist by Jim Berezow. Cover: GM Timur Gareyev by Adam Porth. 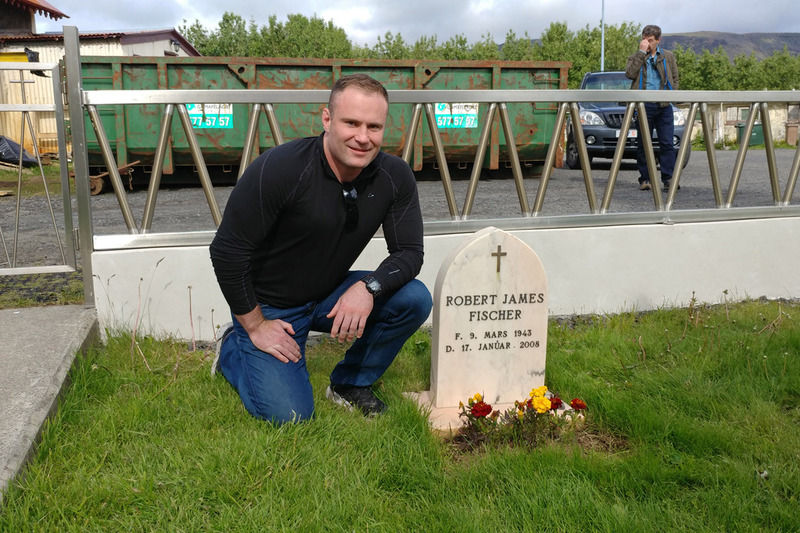 Visit to Fischer's Grave - The son of Oregon chess player Russ Winge recently visited Iceland, including the site of Bobby Fischer's grave, as shown in the photo, at a humble location ... the graveyard of an inconspicuous country church. And, yes, there's construction in progress in the background. For a story of Fischer's life, including the final years in Iceland, consider reading Endgame - Bobby Fischer's Remarkable Rise and Fall ..., by Frank Brady. July magazine! 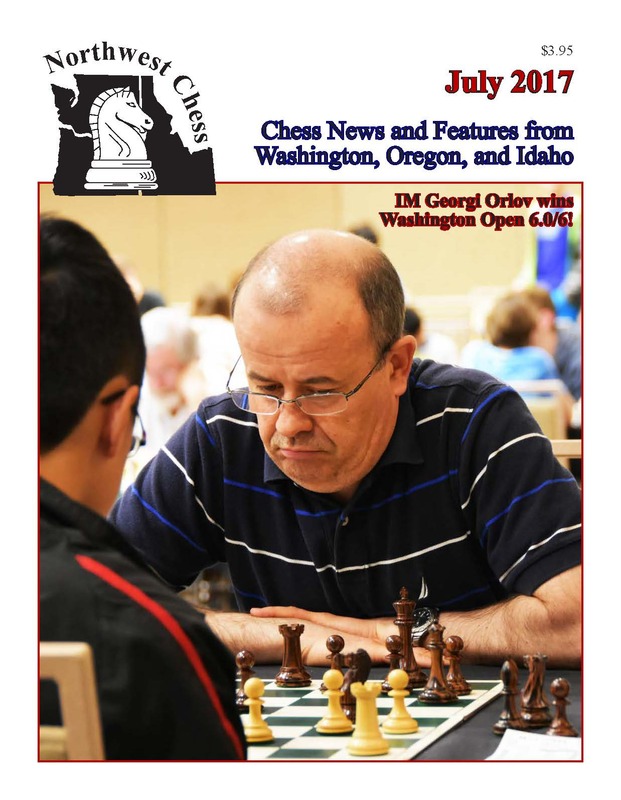 The July issue of Northwest Chess was mailed on 6/28. It's a 32-page issue with "Orlov Triumphs at Washington Open" by Josh Sinanan, "Idaho Scholastic Champion Of Champions" by Jeffrey Roland, "Minda Chen at Chicago All-Girls National Champ" by Zhou Chen, "Susan Polgar National Open" by Monica Olaru, "Spokane Chess Club Elections" by Kevin Korsmo, "May 2017 PCC Game 60" by Brian Berger, "May 2017 PCC Quad 45" by Micah Smith, "Miscellaneous Game from Seattle Masters 8" by Curt Collyer, "Aaron Grabinsky achieves second IM Norm" by Aaron Grabinsky, and a back-cover photo of "Isaias Oregel and other players at Washington Open" by the WCF. Cover: Georgi Orlov at 2017 Washington Open by the WCF. Progress towards Norms! Two Northwest chess players made progress towards international title norms at the Chicago Open, held Memorial Day weekend - IM Luke Harmon-Vellotti (originally from Idaho) is now 2/3 of the way to GM with a second norm; and Aaron Grabinsky of Oregon achieved a second IM norm, finishing with a score of 5.5 of 9, beating two GMs in the process! See link under "Completed Tournament / Match News" for the crosstables. June magazine! 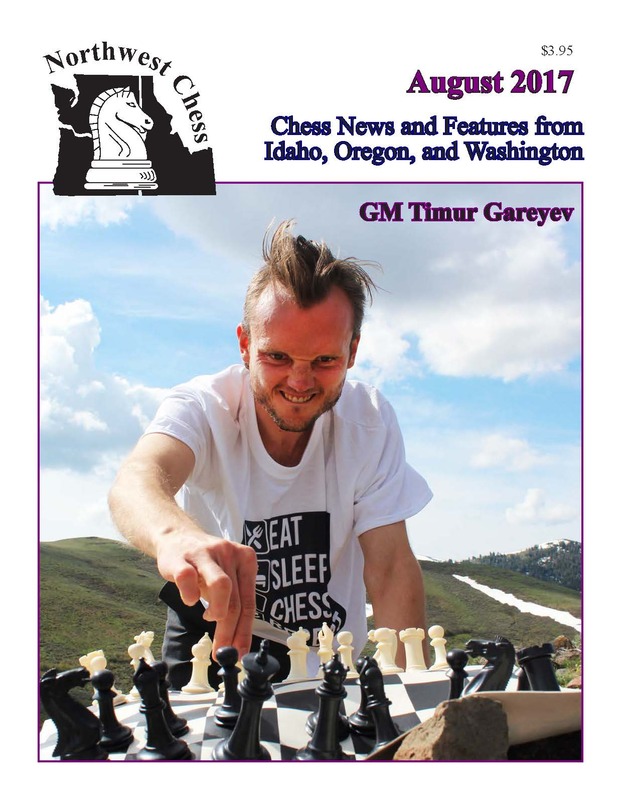 The June issue of Northwest Chess was mailed on 5/23. A limited number of copies were available at the WA Open. It's a 32-page issue with "2017 Idaho Open" by Jeffrey Roland, "11th Annual Clark Harmon Memorial" by Brian Berger, "2017 Grand Pacific Open" by Mike Murray, "Congrats to NM Derek Zhang!" by Josh Sinanan, "BCC #13" by Jeffrey Roland, "MVCC Championship" by Adam Porth, "District 91 Scholastic Chess Tournament" by Jay Simonson, "April 2017 PCC Quad 45" and "April 2017 PCC Game 60" by Brian Berger, "12th Annual OSCF State Championship" by Owen McCoy, "2017 Girls State Scholastic Championship" and "2017 Wood River Elementary Chess Championship" by Adam Porth, and a back-cover photo of "Corey Longhurst at Boise Chess Club" by Jim Berezow. 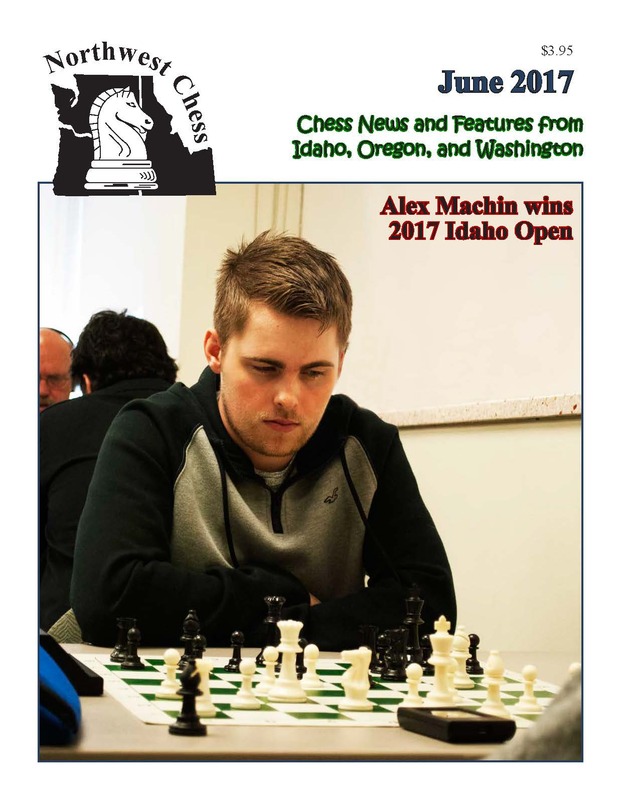 Cover: Alex Machin at 2017 Idaho Open by Jeffrey Roland. Revisiting the 2012 U.S. Open in Vancouver, WA! - See the high-quality set of photos taken by Philip Peterson, the NWC back issues during the Aug-Oct 2012 time period, and the Northwest Chess blog. Interesting Article! See "The Fischer King: Recalling four days in 1964 when Bobby Fischer brought his game to Louisiana" (and was hosted by local chess star Jude Acers) from a 2015 edition of The New Orleans Advocate. Set for Sale! The very intricate hand-made wooden chess/checker set pictured here is for sale for $300. It sits 2' x 2' and 6.5" tall. Contact: Kelly Humeston in Idaho Falls, ID, email kellyinidaho@hotmail.com, phone 208-483-2400. Another New Young Master! Congratulations to Derek Zhang of Bellevue, Washington, who achieved a 2200 U.S. Chess rating as a result of scoring 5 of 7 points in the U2200 section at the 11th Annual Philadelphia Open, Philadelphia, Pa., April 12-16. See the crosstable, and see the blog post by WCF president Josh Sinanan. ... And a Young Google Engineer! See "IM Luke Harmon-Vellotti Joins Google" on the US Chess website. Vellotti, now 18, was a former Idaho and national scholastic chess star. May magazine! The May issue of Northwest Chess was mailed on 4/25. It's a 32-page issue with "Nikolay Minev (1931-2017)" by John Donaldson, "Honors at Scholastic 9-12 Championship" by Jeffrey Roland, "Idaho Scholastic Chess" by Adam Porth and Alise Pemsler, "Ethan Bashkansky Earns National Master Title" by Guy Bashkansky, "Chess Bio - Advaith Vijayakumar," "Washington State Girls Championship" by David Hendricks, "1st Annual Neil Dale Memorial" by Brian Berger, "American Chess Magazine #1 Review" by Ralph Dubisch, "Oregon High School Team State Championships" by Nancy Keller, "March 2017 PCC Quad 45" and "March 2017 PCC Game 60" by Brian Berger, "82nd Montana Open" by Seth Talyansky, "The Kids’ Texas Vacation" by Ralph Dubisch, "Anthony He Earns FIDE Master Title" by Xuhao He, and a back-cover photo of Ralph Dubisch, Duane Polich, and Philip Peterson, by Philip Peterson. Cover: Seth Talyansky at Glacier National Park, by Roza Kotlyar. 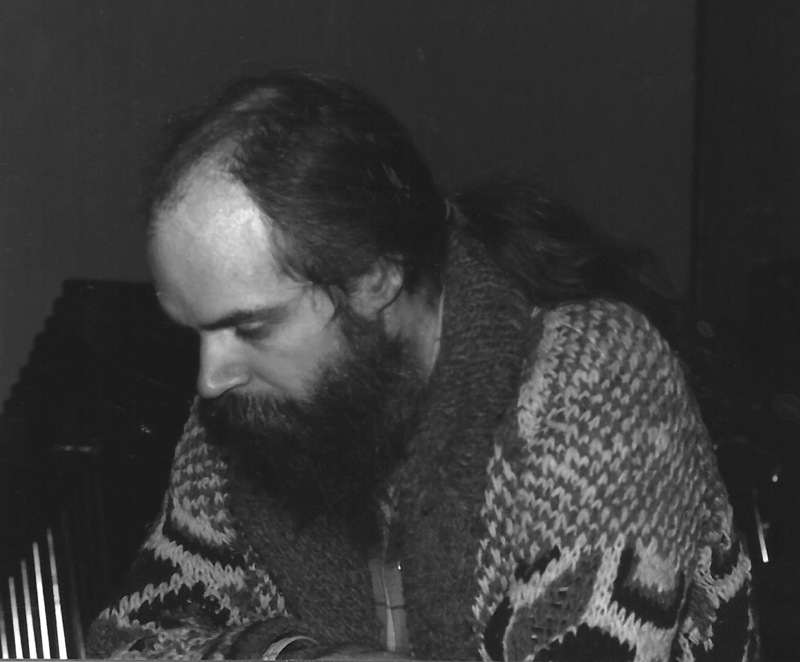 In Memoriam - GM Arthur Bisguier, a largely self-taught U.S. chess grandmaster from the Bronx, New York. See the obituary in The New York Times; also John Henderson's blog. U.S. Championships! The 2017 U.S. Chess Championship took place March 27 - April 10 at the Chess Club and Scholastic Center of Saint Louis, in a 12-Player Round Robin format with a prize fund of $194,000. See the overview page for more information and links, and congratulations to new U.S. chess champion GM Wesley So, who won a Monday playoff for the 2017 U.S. championship. He beat 2006 U.S. champion GM Alex Onischuk. The U.S. Women's Champion is WGM Sabina Foisor, originally from Romania, on her ninth attempt. New FIDE Master! Anthony He became Washington State’s youngest ever FIDE Master on Feb. 20 by scoring 5.5/9 at the WA State Chess Championship in Redmond. See the blog post, and congratulations, Anthony! IMPORTANT - PRINTING ERROR ALERT!! The Seattle Chess Club full-page ad in the April issue of Northwest Chess is in error - the 2016 ad was reprinted by mistake instead of the 2017 ad. Please disregard the printed version. The error has been corrected in the online version. April magazine! The April issue of Northwest Chess was mailed on 3/29. It's a 48-page special issue with "Nikolay Minev (1931-2017) Initial Report," "Oregon State Championship" by Grisha Alpernas, "Washington State Championship" by Josh Sinanan, "Washington Closed Player Bios," "Idaho Closed State Championship" by Barry Eacker, "Changes In The ICA Point To A Bright Future" by Adam Porth, "Become A Prison Chess Volunteer" by Tom Booth, "February 2017 PCC Quad 45" by Brian Berger, "2017 Washington President’s Cup" by Duane Polich, "Bethel February Quads" by Owen McCoy, "John Donaldson Lecture" by Brian Berger, "February 2017 PCC Game 60" by Brian Berger, "25th Dave Collyer Memorial" by Kevin Korsmo, "5th Annual Presidents Weekend Tournament" by Owen McCoy, a "Miscellaneous Game," "Passing Of The Torch for Olympic Chess Club" by William Bodnar, "Bobby Fischer’s Resting Place" by Tom Booth, "Chess Princesses" by Mary McCoy, and a back-cover photo of "T-Shirt of Jeffrey Bret Hall at Idaho Closed" by Jeffrey Roland. Cover: 2017 State Champions (photos by Alpernas, Porth and Sinanan). New National Master! Congratulations to Ethan Bashkansky, who reached a U.S. Chess National Master rating of 2200 at the Super Bowl Tornado on 2/5 in Seattle. Also see the Facebook post, and the family's Chess Travel blog post. Photo at left courtesy of the Bashkansky family. GP Final Results! 2016 Richard Gutman Memorial Grand Prix final standings and results are available from links on the GP page. Checks have been mailed to all the winners (or some Idaho winners received only NWC subscriptions) - Congratulations if you're one of them! In Memoriam - IM Nikolay Minev (1931-2017) - Hanon Russell reports on Facebook (Russell Enterprises, Inc.) that Minev passed away on the evening of March 10. He was born in Bulgaria in 1931, and was champion of his native country in 1953, 1965 and 1966. In the 1980s he emigrated to the United States and settled in the Seattle area. He was a regular contributor to Yasser Seirawan's fine magazine, Inside Chess. He was the author or co-author of over two dozen chess books. Among his best-known works were Mastering Tactical ideas and the outstanding two-volume biographical work on Akiva Rubinstein which he co-authored with John Donaldson. 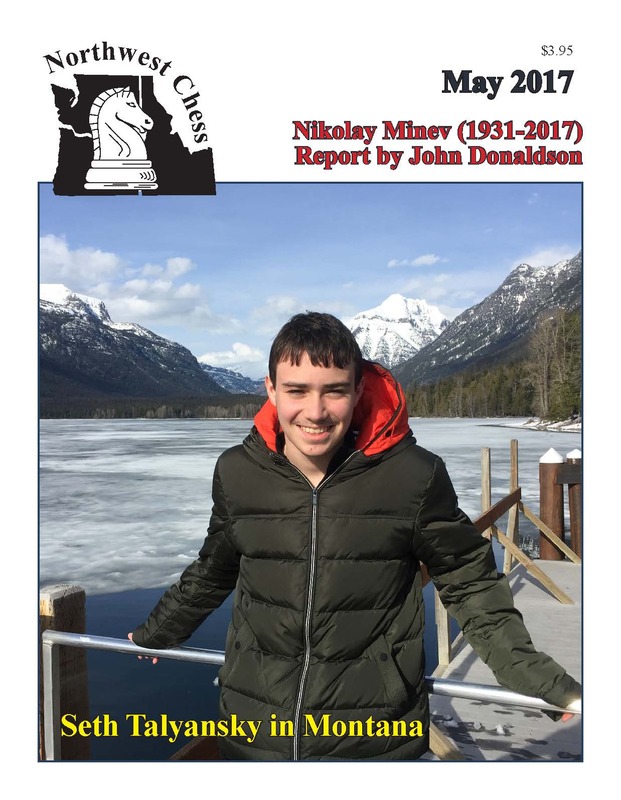 RIP Nikolay... See John Henderson's blog post about Minev, and see Donaldson's article in the May edition of Northwest Chess. March magazine! 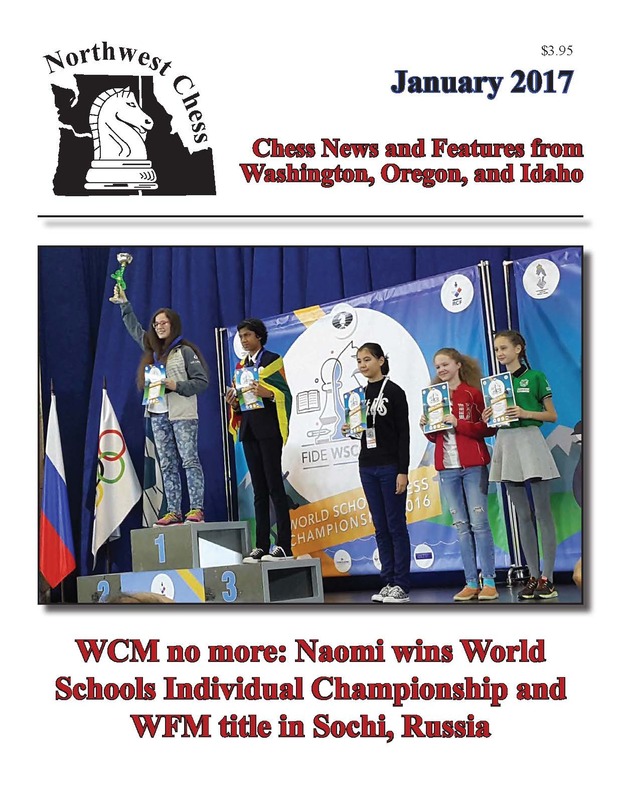 The March issue of Northwest Chess was mailed on Feb. 22. 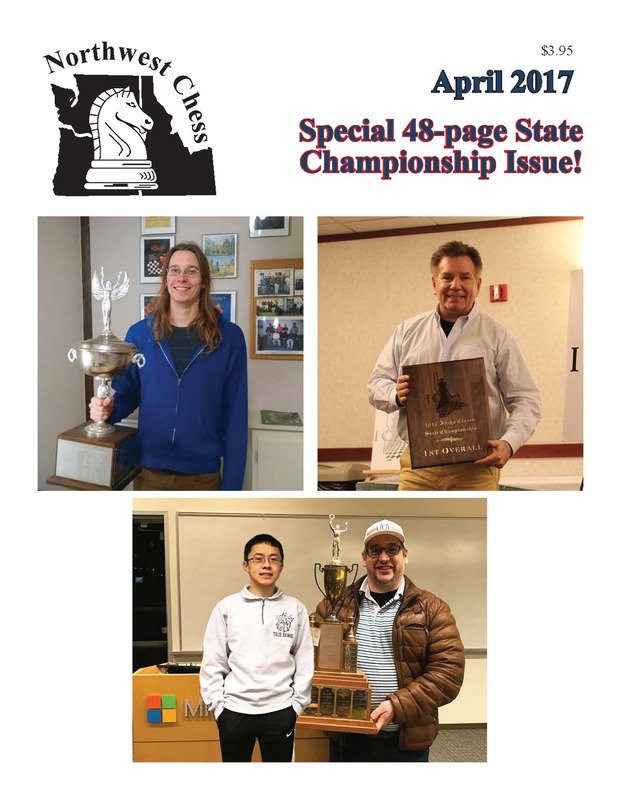 It's a 32-page issue with "Ben Franklin Quote" by Sarah McCoy, "Remembering John Braley (1944-2017)" by John Donaldson, "Film Review: Pawn Sacrifice" by Mike Hasuike, "Anthony He wins 2017 Washington Jr. Closed" / "Washington Junior Open & Reserve" by Gary Dorfner and Josh Sinanan, "Eugene Winter Carnival" by Owen McCoy, a corrected game, "January PCC Quad 45" by Brian Berger, "Bethel January Quads" by Owen McCoy, "Coeur d’Alene Chess Club" by Greg Callen, "Washington State H.S. Individual Championship" by Gary Dorfner and Josh Sinanan,"January PCC Game 60" by Brian Berger, "Emerald City Chess Club Winter Open" by Owen McCoy, "BC and Washington Teams Meet In Historic Match" by Paul Leblanc, "He & Mukumbya Victorious at 4th Seattle Masters" by Gary Dorfner and Josh Sinanan, "2016 NW Grand Prix Final Report" by Murlin Varner, and a back-cover photo of "Adjacent chess automobiles from WA vs. BC Match" by Josh Sinanan. Cover: Anthony He, a 6th grader from Sammamish, at the fourth Seattle Masters tournament. Photo Credit: Josh Sinanan. 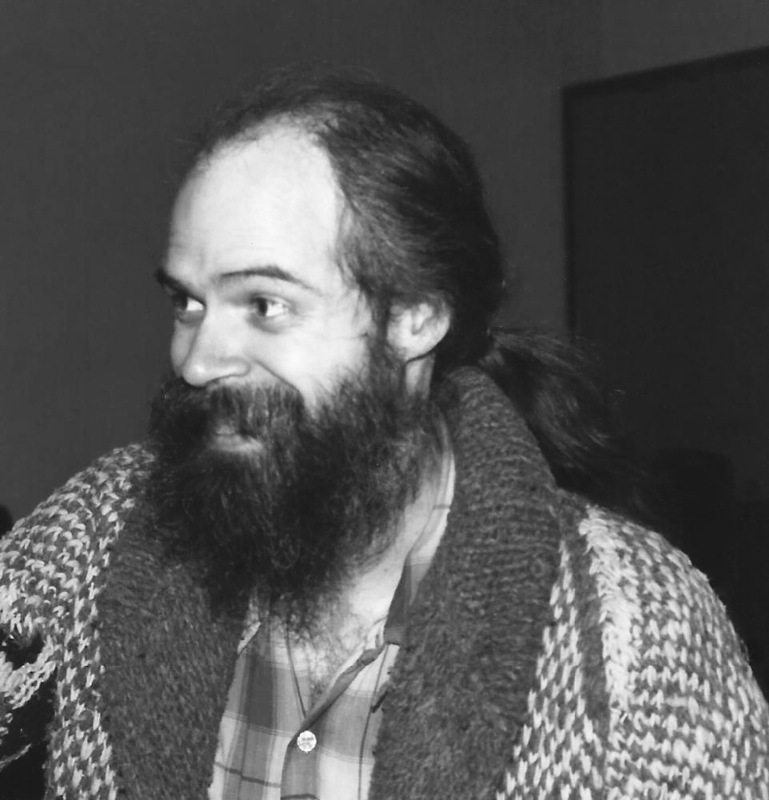 In Memoriam - John A. Braley, 1944-2017, former three-time Washington state chess champion (one tied) and Northwest Chess editor of 18 issues during 1983-1984. John passed away on the evening of Feb. 7 in Seattle. He had been seriously ill for some time. Photos: John Braley c. 1984, courtesy of IM John Donaldson. Also see a short remembrance of John Braley on the U.S. 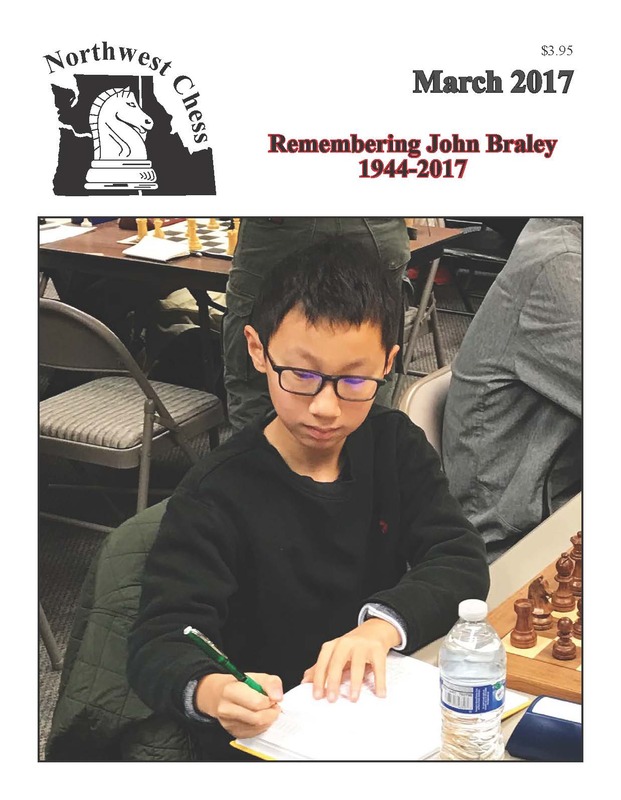 Chess website at https://new.uschess.org/news/john-braley-1944-2017/, and in the Mechanics' Institute Chess Room Newsletter #783. Sluggers/Rain Update! The Seattle Sluggers, formerly one of the teams in the U.S. Chess League, became part of the PRO Chess League in January 2017 - see U.S. Chess League website. The Sluggers conducted a fundraiser to help cover the cost of the team's free agent GMs. See the team's GoFundMe page. Also, here is a season preview article written about the Sluggers on the chess.com news page. Portland also has a team in the PRO Chess League, named the Rain. NM Jason Cigan is on the Portland team; click the link to see his Facebook news feed. Competition for both teams began on Wednesday 1/11. Matches took place on chess.com, with the Sluggers playing at the Orlov Chess Academy in Redmond, Washington. Matches had a time control of G/15 with a 2-second increment (4 games per player). Sluggers match results: lost 5-11 to San Diego Surfers; won 12.5-3.5 against the Rain; lost a "nail-biter" against Dallas, 7.5-8.5; won against their old archrivals, the San Francisco Mechanics, by a score of 8.5-7.5; won against the Dublin Desperadoes from Ireland, 10-6; lost a tough match to the very strong Rio Grande (Texas) team by a score of 6.5-9.5; lost to the Las Vegas Desert Rats by a score of 7-9. After week 7, the team finished with 3 wins and 4 losses, tied with Minnesota, San Francisco, and Pittsburgh; see the league standings. 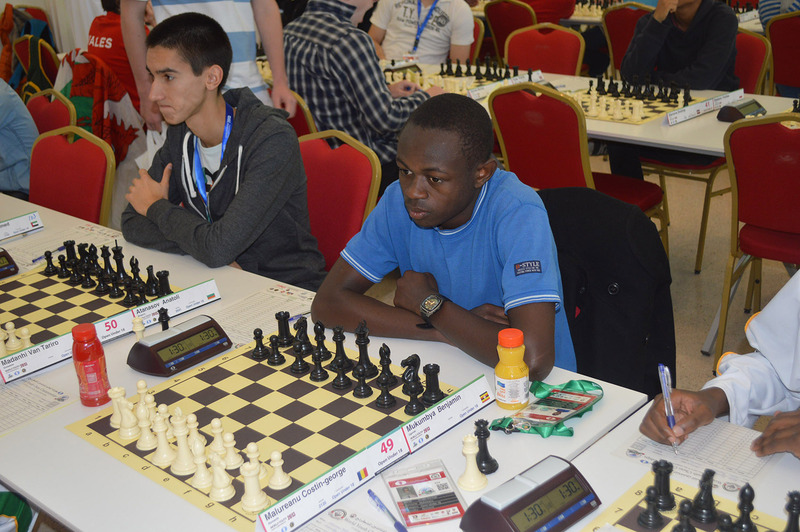 Benjamin Mukumbya (photo above left) is the newest member of the Seattle Sluggers chess team! Benjamin is a strong candidate master from Uganda who was featured in the recent Disney film Queen of Katwe. He recently graduated from high school and is visiting Seattle for six months pursuing the chess master title and studying for his college entrance exams. Benjamin hopes to attend college here in the states in order to become a neurosurgeon. Welcome, Benjamin! In Memoriam - Kornelijs (Neil) Dale, 1933-2016, of Portland, Oregon. See the blog post and the February magazine below. February magazine! 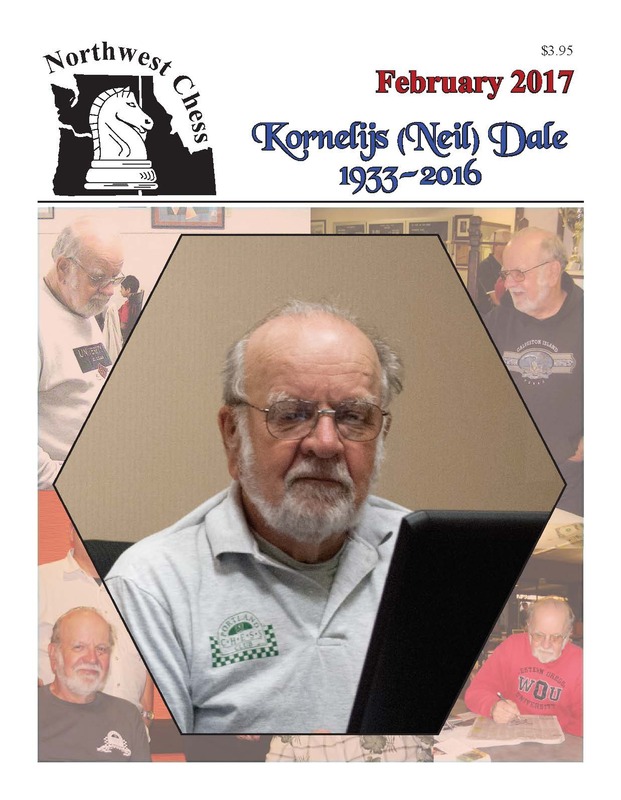 The February issue of Northwest Chess was mailed on 1/25. It's a 32-page issue with "From the Editor’s Desk" by Jeffrey Roland, "A Remembrance of Kornelijs (Neil) Dale" by Brian Berger, "December 2016 PCC Quads 45" by Brian Berger, "Film Review: Queen to Play" by Mike Hasuike, "December 2016 PCC Game 60" by Brian Berger, "Gavin Zhang Wins in Las Vegas" by Casey Bush, "Tiglon, Raptis, and Collyer win Second Seattle Masters" by Josh Sinanan, "Northwest Chess Open" by Duane Polich, "FM Bryce Tiglon wins Third Seattle Masters" by Josh Sinanan, "2016 Washington Game/60 Championship" by Josh Sinanan, and a back-cover photo of "Nick Raptis in victory pose at Northwest Chess Open" by Josh Sinanan. Cover: Various photos of Neil Dale.